THIS image is something most of us will have undoubtedly seen floating around the net for quite some time now. It caused quite a stir over on our forums, and undoubtedly other enthusiast forums all around the globe too. First shown off at Computex earlier this year and only fully confirmed for release a short while ago, XFX's first foray into the PSU market was obviously never going to be a quiet one. However, GPU manufacturers entering the PSU market is by no means a new thing. Back in June I had the opportunity of reviewing a 1200w unit from BFG which failed to impress due to poor performance and quality control issues. Furthermore, Sapphire Technology also recently announced their own PSU range which we already have their 1250w model in the labs for testing. Add to this the already well established list of PSU manufacturers such as OCZ, Corsair, Enermax, Be-Quiet..etc..etc..etc and any manufacturer wanting to muscle in on the power supply market is going to have a hard time finding their feet unless they've got something quite special. The Black Edition 850w boasts up to 90% efficiency with an 80PLUS Silver rating, a single 12v rail, Japanese 105°C capacitors, +3.3v/+5v DC-DC modules with solid state caps and a 135mm fan. Naturally support for multiple high-end graphics cards is also on the list, but we're not going to find out exactly how many PCI-E connectors are included until we take a closer look over the next few pages. XFX have also included a 5yr warranty which should go down well with those of us who keep their hardware for longer than a few months before upgrading. However, do note that you need to register the product in order to take advantage of this, otherwise you'll be stuck with a fairly basic 1yr warranty and a dent in your forehead from the repeated *facepalm* should the PSU go belly up after this time. Power output is fairly common for an enthusiast orientated PSU with almost all of the 850W output being available on a single 12v rail should it be required. As XFX have already said, this eliminates any potential issue where a high current +12v device (such as a graphics card) could trip the OCP (Over Current Protection) on a PSU with say 6 rails rated at 20A each. Some urban myth surrounds this idea though, as most PSU's with 'multiple rails' tend to have each of the PCI-E connectors attached to different rails thereby avoiding this issue entirely. Anyway, it's fair to say from the specs list at least that XFX have put together a PSU that should have most enthusiasts putting their hands in their pockets reaching for their..ahem...wallets right now. So let's press on with the rest of the review to see if it lives up to our expectations. Have to say that video is great for suspense! Rather shocking for such a big brand though. Be interesting to see if they say anything. 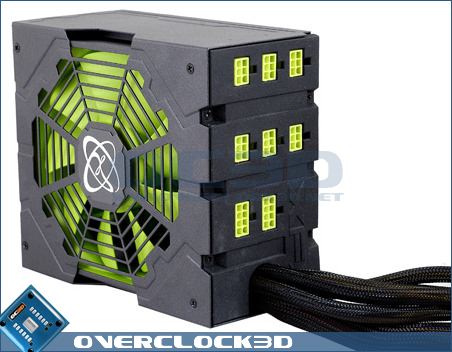 ok is it just me or does the top of that psu look amazing? Couple of cracks and he doesn't jump, flinch, move, gasp... nothing. Still think that people will buy this no matter what just because it looks good and has XFX written on it.